There are many ways to get into and around Harpenden. Choose your method of transport from our helpful information. Located in the St Albans District of Hertfordshire County, Harpenden is a town with a population close to 30,000 people. The town is located in between Luton and St Albans while there are also a number of local villages surrounding the town. Strong rail links ensure that Harpenden is well situated for people who work in London and the demand for property in this commuter town has seen property prices rises to double the average UK property price. There are also train services leaving Harpenden and heading north to Luton, Bedford and Luton Airport while there are also services which extend beyond the heart of London, connecting Harpenden to Gatwick Airport, Brighton, Wimbledon and Sutton. Thameslink provide the services offered at Harpenden Railway station and there are a number of options for commuters. While there are some train services which stop at all stations between Harpenden and the capital, there is an express service which after leaving Harpenden only stops at St Albans before continuing to the heart of the capital. This service allows Harpenden residents to travel to and from St Pancras International in just 23 minutes. The service between Gatwick Airport and Harpenden takes around one hour and ten minutes, ensuring Harpenden residents can reach two major airports in and around London with ease. 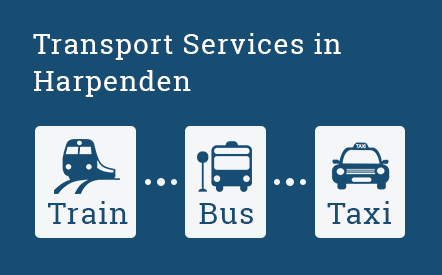 When it comes to taking a bus to and from Harpenden, there are four main routes and these provide a reliable and frequent service. Arriva provide a 321 service which runs between Luton Station and Watford Town Centre, via St Albans. This passes through Harpenden every half an hour 6 days a week and every hour on a Sunday. Centrebus provides a service that runs between Luton and South Hatfield, passing through Harpenden once an hour and this service runs between Monday and Saturday. Uno provide two bus services that pass through Harpenden. The 635 service runs Monday to Friday and is an hourly service, connecting Luton and London Colney. The 657 service runs Monday to Saturday and is an hour service, connecting St Albans and Redbourn. The M1 runs close to Harpenden with the nearest junctions being Junction 9, for Redbourn and Dunstable, and Junction 10 which is for Luton and Luton Airport. If you are looking to travel to Harpenden from Luton Airport or from Luton or St Albans, you will likely find that a Harpenden Taxis is the most convenient way to travel. If you have a lot of luggage or you have a number of people travelling in your party, booking an 8 seat taxi or a larger vehicle will make the price more affordable while ensuring you don't have to worry about connections or walking short distances.